CES Touch Version 10 is on its way! Following the great success of Touch Version 9, our best version to date, we are now taking it to a new level with the release of Version 10. Our aim is to continually improve our product and Version 10 is all about adding wish list requests for new features that we regularly receive from both dealers and end users. Here are a few we are excited to share with you. 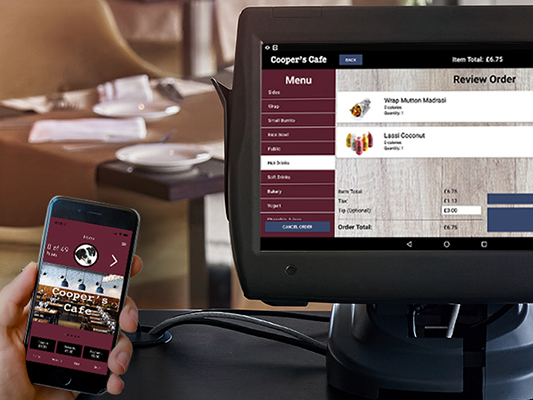 We have partnered up with Skoop, a market leading company based in New York who can offer a state of the art multi-site loyalty rewards system with mobile apps. Fully integrated kiosk terminals that will work alongside touch enabling the use of tills and kiosks to work together in the same outlet sharing the same kitchen printers, stock file etc. New border added around the buttons to give a fresh look for version 10. If you don't prefer the new buttons and like things the way the were, a system option has been added so you can revert back to version 9 style buttons! Condiments have been moved into a new section on the product maintenance screen where a new option can also be found to add menus. You can now have up to six condiments per product rather than the three allowed in previous versions. The number of condiments per menu has also been increased from sixteen to twenty. There is also a new shortcut option to add or edit condiments from the product maintenance screen to make it more efficient when adding new products that require condiments. Greater flexibility has now been added using the new option to add up to 6 menus to pop up automatically when selling a product. 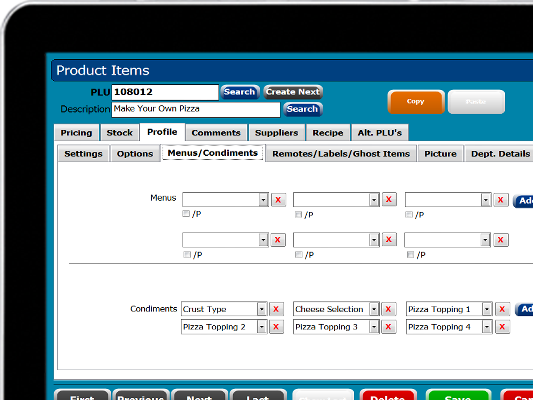 This can be used for chargeable condiments such as extra toppings or for set menus to select 3 courses. There is also an option to set the /P switch by ticking the box to make the menu persistent. New button command X*CONDI or X*CONDI/P ( X = Condiment Number) you can now manually enter condiments by pressing a button when required. Very useful for kitchen instructions, the condiments selected will get assigned to the last product entered. A new button command has been added CHANGE CONDIMENTS that allows you to reselect the condiments on a product without having to void it first. 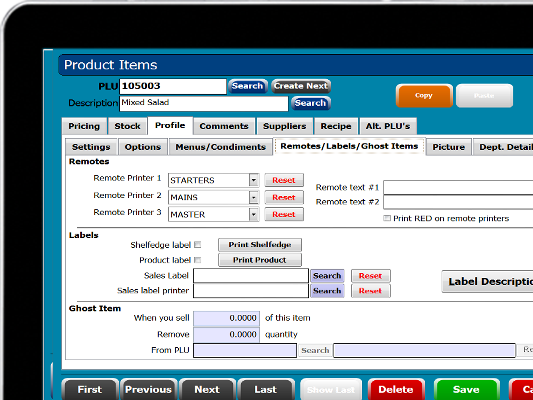 Pressing the button will show a void type grid screen that will only show products that have condiments entered. It is now possible to set products to print to up to 3 remote printers adding a lot more flexibility for kitchen printing. 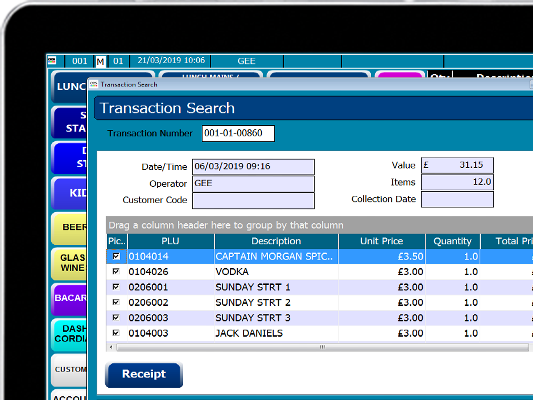 Display Sale function updated with 4 additional buttons to enable users to view receipts more efficiently using the new first, last, previous and next buttons. The Error Correct function now has its own record type (EC) and reports separately from Voids on Terminals Reports and Sales Review. Error Correct now has its own reasons and there is a new back office setting 'Error correct have reason codes' which defaults to YES and can be set to NO. It is now possible to have reasons enabled for Voids and turned off for Error Correct if required. This will be a very popular update for CES dealers and end users alike as it is no longer necessary to archive the sales data at the beginning of every month. The traditional allsales file that held the current months sales is no longer used, instead when an EOD is run the sales data will go straight into the current months archive file. When upgrading from previous versions any sales data held in the allsales file will automatically get archived when the first EOD is run. All areas affected by this change such as reporting, sales review and customer account invoice reprints have been updated to use the current months archive file. Stock transaction archiving on systems that have it enabled will run automatically at the beginning of the month as part of the EOD procedure. Discount functions have a new switch /F that can be added onto the end of the button command. The /F switch is used to force the discount regardless of the maximum discount settings on products or departments. For example a button command set as ALLDISCOUNT100*P/3/F would give 100% discount using discount reason 3 and override the maximum discount settings. 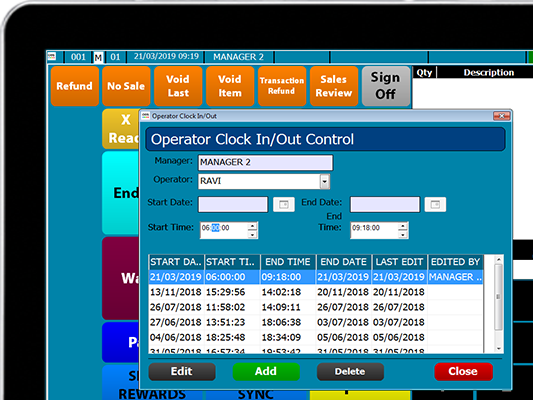 This can be very useful for manager functions such as wastage or complimentary discounts where specific manager discount buttons can be setup on the manger screen that allows 100% discounts to override the current maximum discount settings. A new Tax Shift section has been added to the Terminal Reports that will give really useful information when Tax Shifts are in use. 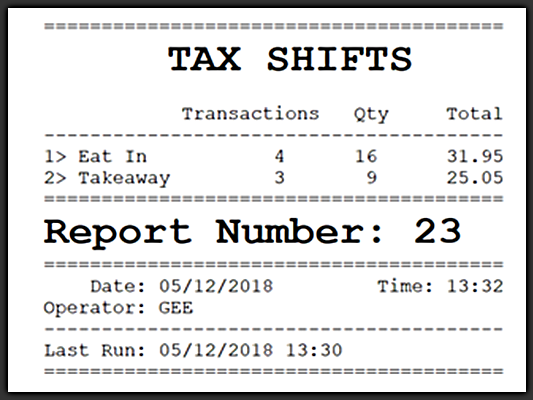 For people who use Tax Shifts for Eat In and Takeaway they will now get as shown on the End of Day and Financial Terminal Reports. Based on the transaction refund function we have developed a new function to search for any previous transaction with an option to reprint the receipt. 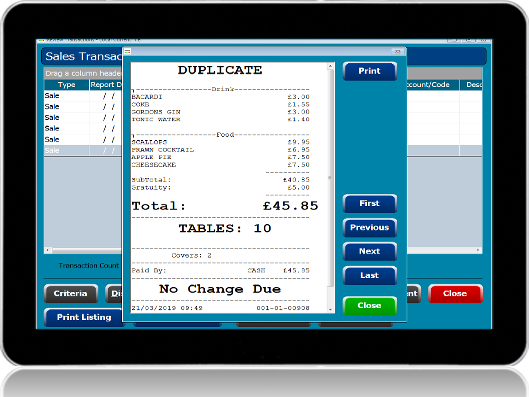 On previous versions it was only possible to enter an open gratuity amount to a bill when using integrated payments. 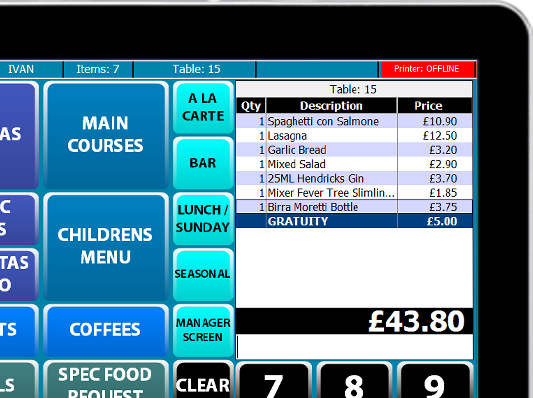 Open gratuity amounts can now be added or removed by using new button commands GRATUITY /ADD and GRATUITY /REMOVE. As shown below the gratuity amount will show separately from the products in the sales grid and report in its own section on the terminal reports. Receipts will also print the gratuity amount in a separate section the same way it does with the traditional service charge. 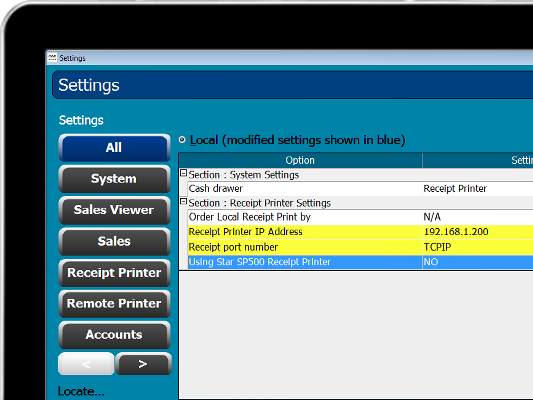 Direct printing to network receipt printers is now available connecting directly to the printers IP address as shown below. This will be expanded to support remote printers in the near future.